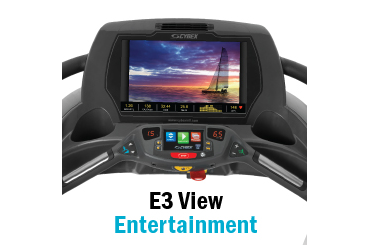 Get in shape fast with the ProForm� 410 CE Elliptical! Jillian Michaels, America's Toughest Trainer, coaches you through 8 weeks of included weight-loss workouts! You'll lose weight, tone muscle and get incredible results. And, for more targeted training, innovative pedals adjust your toe-to-heel angle to isolate your trouble spots! The 410 CE Elliptical also features SpaceSaverreg; Design. Perfect for any home, the base and pedals fold up and out of the way, saving nearly 3 feet of precious floor space! Enjoy long, full strides and develop lean muscle with this generous 18" stride length. 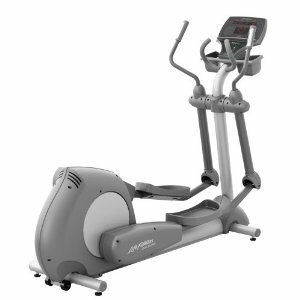 The ProForm� 10.0 CE elliptical is protected with a Lifetime Frame Warranty, 1-Year Parts & Labor. Fitness is about getting in shape, not getting in your way. This elliptical's innovative pedals and base fold-up quickly and easily to save you nearly 3 feet of precious floor space. Step up your training with built-in workouts designed by a Certified Personal Trainer. Burn calories and fat with 8 Weight-Loss Workouts that automatically adjust the resistance and workout intensity. And, with 8 Timed Workouts, you'll target specific time goals and fit workouts into your schedule for maximum results! Lose weight and burn more calories with Jillian Michaels, America's Toughest Trainer. The included workout card plugs directly into the console and delivers 8 weeks of audio coaching and weight-loss workouts with Jillian Michaels! Each workout is progressive and automatically adjusts your resistance so you get amazing results! Target different muscle groups and find a better fit with these adjustable pedals. Two angle adjustments isolate different muscles and create a more dynamic workout. Quickly personalize your toe-to-heel angle for a more comfortable stride! Move to the beat of your favorite music with this built-in sound system. Plug your iPod�, or MP3 Player, into the Interplay� Music Port for unbeatable sound quality. With the iPod� resting on the console shelf, it's within easy reach and leaves the controls right at your fingertips. As you match the encouraging cadence of the concert-like sound, you'll discover the dramatic difference the Interplay� Music Port brings to your workout. Track your progress in real time with this backlit display. This window displays multiple information fields or, for more at-a-glance information, a single display for on-the-fly goal training. Track your speed, time, distance, resistance, calories burned and pulse. This display also features a 5x7 workout matrix for a graphical representation of your workout. 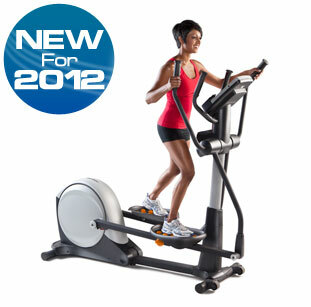 The built-in wheels make moving this elliptical from one place to another fast and easy.